Singapore’s defining achievement is summed up in the title of its longtime leader Lee Kuan Yew’s memoir, From Third World to First. When it split off from Malaysia a half-century ago to become a separate nation of dubious viability, Singapore had little going for it, other than a determination to become whatever it needed to be—assembly plant, container port, trustworthy banking and logistics center, semiconductor hub, oil refinery, mall developer, you name it. But the brilliance of its founding fathers—OK, it was mostly one father, Mr. Lee—was in realizing that the precondition for any and all of this to happen was good governance. Over a recent week of meetings and briefings with Singaporean business and government leaders sponsored by the nonprofit Singapore International Foundation, two offhand remarks bore this out. The first was a statement by one business leader that he has never had to pay a bribe in his lifetime. To an American audience, that may seem like a fairly modest boast, but as this speaker noted, it’d be a difficult claim to make in neighboring Southeast Asian countries (or developing nations anywhere). Growing up in Mexico, my dad (a businessman who’d never set foot in Singapore) would often go on and on at dinner about how our country needed a Lee Kuan Yew. I had a vague sense of what Dad meant, but only now do I get the vehemence behind his sentiment. You couldn’t get by in Mexico back then without paying bribes, constantly. Like Americans, Singaporeans worship the concept of meritocracy. Unlike Americans, Singaporeans entrusted their society to an all-knowing one-party technocracy, a civil service that has delivered the goods across two generations—including affordable, publicly built housing for a majority of the population and a system of private lifetime savings vehicles that are the envy of policy wonks the world over. Society’s cohesive glue, in addition to English, is a collective form of the “Singlish/Chinese” term kiasu, which roughly translates into a fear of losing or being left behind. Kiasu usually refers to the extraordinary lengths to which people—individually and collectively—have gone to ensure success. And the motivating anxieties are not hard to discern in a nation-state so small it must rely on other countries for the water it drinks and the space to train its armed forces. What if China and some other Asian state go to war over disputed islands? What if Shanghai or Hong Kong leverage their domestic markets to overshadow you as Asian financial hub? What if the Malaysians cut off your water? The brutal Japanese occupation during World War II and the recent heart-wrenching dip in trade during the financial crisis of the last decade are stark reminders of how quickly things can sour for a vulnerable canary in a gold mine. Even now, at the height of its success, Singapore doesn’t get much love (as opposed to grudging respect) from the legions of foreigners who avail themselves of its First World amenities. It’s almost obligatory for Westerners visiting or residing in Singapore to complain about the “sterility” of the place, and joke about the carefully manicured boulevards and the pristine shopping malls, contrasting Singapore unflatteringly to the grittier authenticity and “character” of nearby Cambodia and Vietnam. It’s indeed easy to mock Singapore if you haven’t lived in a poor country, and it’s a form of colonial prejudice to begrudge Singaporeans their lack of Third World “charm.” We prefer our tropics to be exotically chaotic, thank you—not tidier and more efficient than the Swiss. But the interesting wrinkle here is that Singaporeans themselves seem to be joining in the second-guessing about the price of development. Opposition parties are gaining some ground in parliamentary elections, capitalizing on unhappiness with strained public services, soaring prices, and an influx of super-wealthy foreign investors that resulted from the government’s openness to rapid growth. Having taken care of its population’s basic needs and then some, it must be galling for Singapore’s relentlessly pragmatic leadership to see a surge of yearning for rooted authenticity. The few older neighborhoods that haven’t been demolished—including the first generation of public housing complexes—are now heralded as historic landmarks, and Singaporeans treat their old botanical gardens as sacred ground. At the Singaporean government’s world-renowned scenario-planning futures think tank, one analyst confided that she is looking into the uptick of nostalgia and what it might mean for policy. This ill-defined sense of nostalgia (presumably an irrational sentiment in a place that’s gone from Third to First World in record time!) reflects the tensions inherent in globalization. You can leverage all of your comparative advantages to succeed in the global marketplace, and transform yourself accordingly, only to end up feeling some unease at having your distinctive sense of place eroded. A general unease about Singapore’s identity and concerns about overcrowding (owning a Honda Accord will set you back more than $100,000, in what has to be the bluntest form of congestion pricing anywhere) have forced the government to slow down its intake of immigrants and taper its growth projections. The move was a testament to how responsive Singapore’s system can be to its citizenry’s needs and desires, without being terribly democratic. It was a testament, too, to how perfect Singapore—and its paternalistic, technocratic cosmopolitanism—is for an age of interdependence that prizes connectivity over a sense of place. 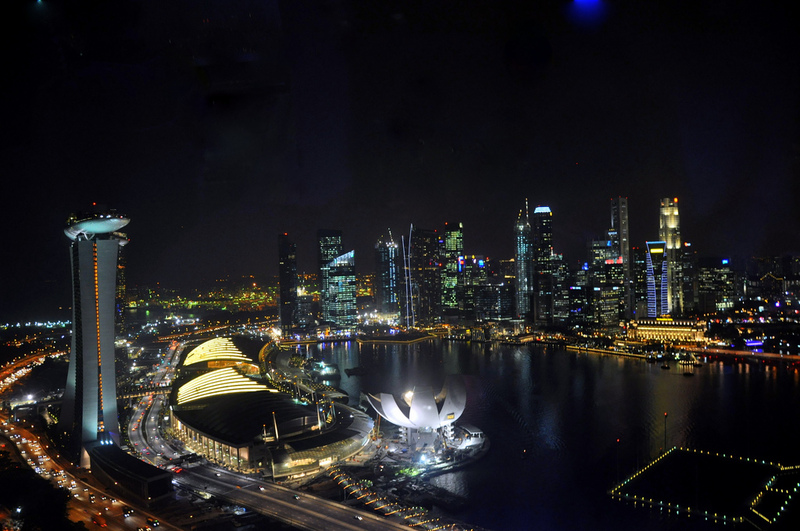 There are many cautionary tales to globalization’s downsides, but no better canary in the gold mine of globalization’s tenuous triumphs than Singapore. *Photo courtesy of Eustaquio Santimano.